Do you like crunchy, breaded, or fried food, but don't like the calories in bread? Have you tried some of the diet recipes that recommend using Fiber One cereal as a breading substitute, but don't like the fact that Fiber One has aspartame in it? If so, then this is the post for you! 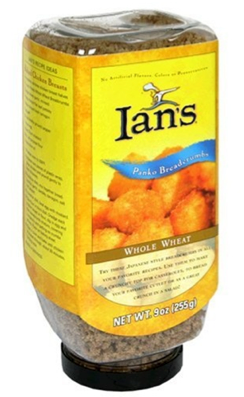 About a month ago, I was thrilled to discover these Whole Wheat Panko bread crumbs made by Ian's ( the company that makes low calorie cheeze-it like crackers, and 100 calorie packs of cookie buttons ) at my local Whole Foods. The bread crumbs are made entirely from unbleached whole wheat flour, malt extract, yeast, and salt and contain only 70 calories, half a gram of fat, 2 grams of fiber, and 3 grams of protein per quarter of a cup serving (so only one weight watchers point!). The bread crumbs are tasty and versatile and I will be leveraging them in upcoming recipes, so I'm excited to introduce them. If you can't find them, don't lose hope, however. You can still toast your favorite low calorie whole wheat bread and then chop it into little bread crumb pieces in your mini Cuisinart. I've been looking for whole wheat breadcrumbs for a long time and could't find it! I'll definitely get this one this weekend. I hope my local WF carry this. I can't thank you enough for this tip, Juliet! I've been looking for WW breadcrumbs for nearly a year and have been making my own. My lesson for the day ... must venture downtown to Whole Foods more often. Thank you! oh wow - i need to get some of these. that sounds like a crumb buy! Good to know! I've used two other alternatives to bread crumbs. First, I've used wheat germ to replace some of the bread crumbs. Wheat germ contains lots of great nutrients. Second, I've used rolled oats instead of bread crumbs in recipes like meat loaf. Rolled oats are also much healthier and more filling than regular bread crumbs, and I imagine you can put them through a blender and add spices to make them more bread crumb like. So why to you SELL thes panko bread crumbs. I need them shipped to me, as I live in the Turks & Caicos Islands.